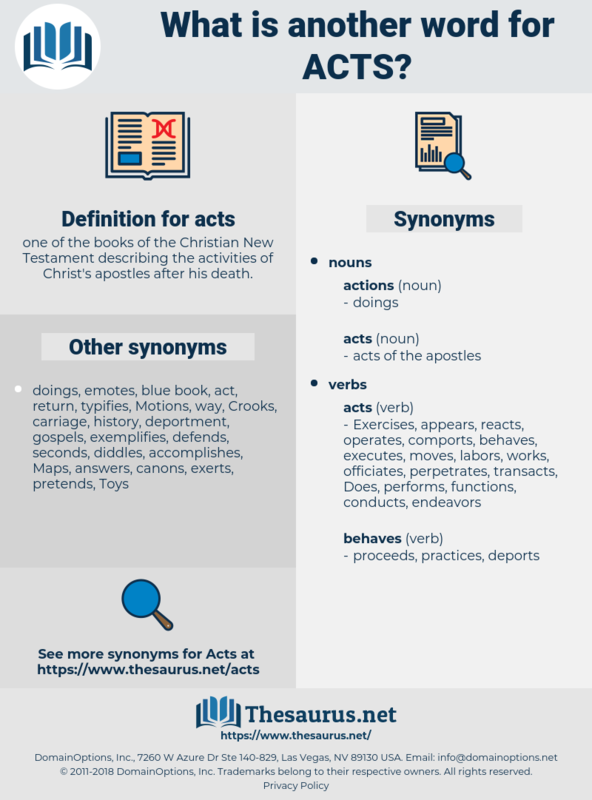 What is another word for acts? one of the books of the Christian New Testament describing the activities of Christ's apostles after his death. activity, enactments, Activities, attacks, action, actions. 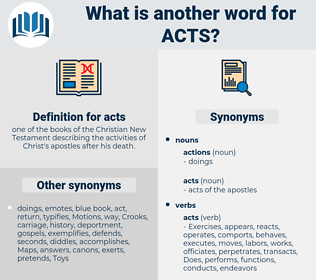 Behaviors, ordinances, statues, Treaties, Activities, Regulations, Gestures, procedures, developments, documents, rules, Records, Rights, actes, actos, laws, legislations, actions. Activities, attacks, determinations, infractions, Regulations, Gestures, dispositions, conventions, requirements, procedures, breaches, developments, offenses, documents, rules, Records, pictures, Rights, Workmen, labourers, Judgments, actes, Persons, women, Forms, items, rulings, offers, Les, Its, Does, actos, laws, legislations, action, actions. massacres, assassinations, criminals, responsibilities, Constitutions, misdemeanours, initiatives, terrorists, assaults, statements, manifestations, Instrumentalities, agreements, Classes, Aggressions, demonstrations, accidents, Achievements, catches, actors, factors, encroachments, disappearances, instances, stages, situations, aspects, perpetrators, resolutions, performances, occurrences, machinations, charters, Measurements, celebrations, incidents, Behaviors, organisations, Atrocities, principles, presentations, misdemeanors, matters, purposes, stipulations, shortcomings, threats, politicians, observances, treatments, jurisdictions, relationships, tasks, commitments, interventions, cooperatives, projects, reactions, sanctions, Occupations, entrepreneurs, performers, implements, disasters, cases, Punishments, mechanisms, mandates, directives, civilians, exactions, malpractices, qualifications, mistakes, institutions, Undertakings, sentences, artistes, misdeeds, obligations, allegations, abuses, interactions, Irregularities, reports, Publications, Categories, Negotiations, locations, competences, campaigns, ordinances, Exercises, clauses, materials, complaints, prosecutions, enterprises, Securities, concerts, artists, statues, Organizations, expressions, deliberations, functions, positions, outcomes, crashes, proposals, responses, speeches, drafts, Standards, Hundreds, Treaties, blasts, issuances, failings, milestones, Attitudes, faults, productions, attempts, causes, Activities, discussions, Tests, Incentives, endeavours, therapies, issues, ensembles, Killings, displays, outrages, victims, excesses, solutions, submissions, conclusions, donations, failures, Murders, Phenomena, competencies, scripts, Ceremonies, results, officials, comments, registers, grievances, schemes, investors, Penalties, PATHWAYS, Essays, serves, Cultures, offenders, foreigners, adventures, packages, Efforts, explosions, juveniles, Incidences, kinds, remarks, shapes, Textbooks, Realities, points, Strikes, variables, Outbreaks, Duties, patterns, edicts, Survivors, provinces, Languages, authors, approaches, stresses, dossiers, offerings, benefits, protests, reasons, Policies, Charges, experiences, episodes, forces, highlights, Stories, Assemblies, Riots, Anomalies, raids, Companies, agents, Risks, Agencies, choices, seals, ventures, lists, problems, citizens, features, scenes, types, horrors, Diplomas, processes, Pleadings, objects, Missions, versions, pieces, Salaries, takes, writers, sets, claims, concerns, Plays, notices, programmes, inputs, Guidelines, employers, levels, laborers, routes, methods, suits, posts, Rallies, chores, bombers, ideologies, Programs, skills, clerks, frameworks, Vehicles, Permits, priorities, players, trends, employees, examples, sponsors, Shots, options, notes, lawmakers, errors, shows, Energies, Beliefs, Truths, counts, CREWS, merits, Roles, Copies, Equities, Gains, degrees, BOMBS, Motions, ills, beings, regimes, Remedies, Entries, members, orders, books, blows, norms, MINERS, groups, Misses, deals, powers, uses, Firms, Drives, Ones, Movements, units, files, attacks, Parties, Levies, appeals, figures, Lives, Cas, ages, runs, determinations, meetings, infractions, Regulations, Gestures, dispositions, conventions, requirements, procedures, breaches, developments, offenses, documents, 'actes, behaviours, rules, Records, LINEs, Rights, Workmen, labourers, Judgments, transactions, actes, Persons, women, Forms, items, rulings, conducts, actos, laws, legislations, doings, action, actions. reacts, interacts, activates, acknowledges, initiatives, Affects, connects, effect, coordinates, Co-ordinates, indicates, Instrumentalities, behaves, reflects, deliberates, directorate, campaign, administers, exists, creates, headquarters, Behaviors, contains, stands, accounts, matters, procedure, measurement, considers, interventions, Addresses, correspond, corresponds, maintains, implements, speaks, Carries, represents, civilians, engages, recognizes, encourages, contributes, presents, complies, performs, encompasses, becomes, decides, Exercises, comprises, completes, supports, centre, recourse, exerts, functions, assumes, SITS, resort, proposes, handles, discusses, calls, remains, satisfies, Treaties, enables, relates, recommends, intends, fulfills, causes, follows, Comes, rule, expands, delivers, regards, replaces, expresses, occupies, turns, results, entails, budget, serves, stems, appears, arises, says, occurs, helps, fulfils, vote, voting, suffers, points, harbors, receives, depends, places, favours, seeks, approaches, aims, Charges, answers, highlights, includes, raids, secures, leads, marks, happens, employs, amounts, falls, promotes, processes, modifies, fosters, lies, use, takes, enters, sets, involves, needs, claims, poses, concerns, applies, Plays, looks, covers, programmes, Bears, implies, wants, wishes, power, seems, fills, notes, shows, counts, Has, requires, brings, holds, Remedies, puts, refers, body, goes, deals, meets, uses, runs, determinations, 's, requirements, procedures, documents, behaviours, rules, Records, Judgments, Forms, rulings, conducts, offers, Les, Does, actos, legislations. In receiving new members, and in all acts of discipline, we must advise with the church already gathered. You must be as quick as ever you can between the acts, for all the fun will be spoiled if you keep your audience waiting. acetous, ascidiaceae, aquatic, x., agastache, acid-wash, astacus, aegates, act as, acathexis, azotic, acoustic, acidotic, assiduous, assets, acidic, acacia catechu, acathexia, agiotage, act's, augustus, asdic, ax, aesthetic, Asio Otus, aquatics, acetic, aztec, asiatic, acetose, axe, ascitic, Aesthesis, Auschwitz, Aesthesia, aegisthus, ascetic, acoustics, augitic, ascites, actias, auxetic, actitis, acetate disk, acidosis, astatic, astasia, aesthetics, agathis.